The 9pc Ocean Blue Baby Bedding Collection by Sweet Jojo Designs will create a deep sea setting for your little ocean adventurer. 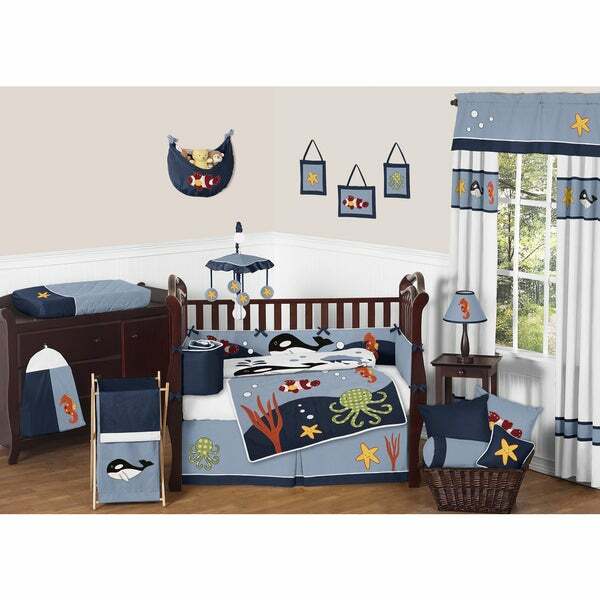 This adorable crib bedding set features detailed fish and sea life themed appliques and embroidery works. It combines 100-percent cotton and microsuede fabrics and uses a color palette of blue, navy, red, orange, yellow, green, black, and crisp white. This Sweet Jojo Designs set will fit all standard cribs and toddler beds and is machine washable for easy care and repeated use. I love the materials used in this crib set. It's so cute, and looks to be well made.